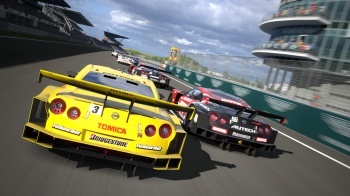 Though the head of Polyphony Digital has apologized for the recent delay of Gran Turismo 5, it still makes Sony sad. It was believed that Gran Turismo 5 would finally be released on November 2, 2010 after many delays and more than five years in development, but yesterday Polyphony Digital announced the game would be delayed once again. Polyphony head Kazunori Yamauchi recently took to Twitter to explain why it was delayed less than three weeks away from its supposedly final release date, but every explanation in the world wasn't good enough to cheer up Sony. Kotaku translates Yamauchi's tweet to: "Apologies for the delay. It's because time and labor were spent ironing the kinks out of [Gran Turismo 5's] complex system. I'm really sorry. Everyone, it's inexcusable... Wait a little longer." The game is still planned for release by the end of 2010, with Andriasang translating a later tweet to: "I believe we won't keep you waiting until [the end of the year]." Sony Computer Entertainment America producer Taku Imasaki further explained the situation to the New York Times. "We're really close, but this was an executive decision that was made yesterday," he said. "Realistically, we thought we had a good date. We're not happy over here." Imasaki confidently said that racing game fans "won't see too much more delay." Unlike Duke Nukem Forever, which was constantly delayed with little to no gameplay ever shown until recently, Gran Turismo 5 at least hasn't been hiding behind a curtain. Seriously though, let's just get this thing out already, okay?